Home projects never seem to go as planned. Whether the project may seem as simple as hanging shelves, something always seems to go a rye. Though your intentions might be good ones, it never fails that the simplest of tasks tend to be more of a challenge than was first anticipated. Home repairs can be rather costly if not done correctly. When time comes to approach a home repair or home project such as purchasing, remodeling or installing a chimney cover, asking an experienced person might prove to be beneficial. Not enough ventilation to create proper and healthy air flow. Downdraft might occur creating a safety hazard as a result of smoke. Squirrels, birds, bats and other nasty little varmints can hibernate inside your chimney creating a dangerous blockage. Debris and other elements such as weather might cause severe interior chimney damage. A chimney cover aids as protection against these things and helps keep chimney cost and repairs as low as possible. A chimney cover is necessary in order to assure that the flue to your fireplace is protected. An improper fit can affect the use of your fireplace. Precise measurements are needed to assure that a proper fit is had; therefore consulting a professional is strongly suggested. A specialist who is familiar with the different types of chimney’s can assist you with purchasing the correct chimney cover. Companies, such as Fresh Air Manufacturing Company also known as FAMCO, manufacture a wide variety of chimney covers and adaptors guaranteeing that you will find the perfect fit and desired look for your home. Depending on what part of the world you live in or your climate condition, certain metals used in the making of the cover will determine which cover is best suited for your home. Weather plays a part in the upkeep and maintenance of your chimney and provides a layer of protection for your flue. The professionals at FAMCO take pride in providing their clients with high quality products that provide durability and excellent ventilation. For those, who do not posses strong handyman abilities, speaking with a FAMCO specialist regarding your chimney repair project could save you time, money and many frustrating hours. 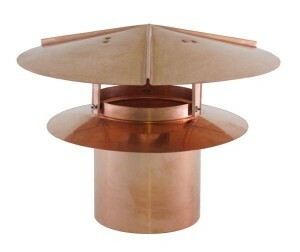 Next post: Why Copper Chimney Caps?